Ideal to Remotely Monitor Your PC From Any Internet Location. Monitor and Spy on Your Computer From Any Internet Location! 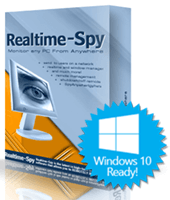 Realtime Spy remote PC monitor is the latest in high-tech surveillance software that allows you to REMOTELY INSTALL the monitoring software on your computer and access the activity logs from ANYWHERE via your own personal Realtime Spy Webspace! Realtime Spy can show you what users do, and what users type in real-time. All you have to do is point your browser to your own Realtime Spy remote PC monitor website address to view logs from any machines you deploy Realtime Spy on! All logs are password protected and securely stored for your eyes only. Realtime Spy is the most robust remotely installable, remotely viewable monitoring software available. Remotely Installable - No Physical Presence Needed! No physical presence is needed for installation - Realtime Spy remote PC monitoring software can be installed by sending a single file to the target computer you own. To install, the user of your computer only has to accept the monitoring software installation notice. Realtime Spy can later be uninstalled from a remote computer without physical interaction. Realtime Spy's logging settings can also be configured remotely without having to reinstall the logging software on the monitored computer. Realtime Spy's web-based log viewing system allows you to view captured activity logs at any time, and from any location, via your own secure personal web-space. Activity logs are presented in easy-to-read web pages that are organized by activity type for quick viewing and management. Logs are categorized so multiple users on multiple computers can be monitored together without any confusion. Realtime Spy's monitoring features allow you to record everything users do on your computer. Realtime Spy remote PC monitoring software can log keystrokes, passwords, website activity, application usage, file and document usage, internet connections, chats and emails, screenshots, and more. Realtime Spy can also display activities and keystrokes in real-time, as they occur. Realtime Spy remote PC monitoring software is designed to be an invisible and secure monitoring system. Realtime Spy cloaks itself after it is installed, and does not reveal itself to the user on their desktop or programs menu (unless you want it to). Realtime Spy can also disable popular anti-spies that may interfere with its operation. Realtime Spy's web access is password protected so only you can view activity logs. 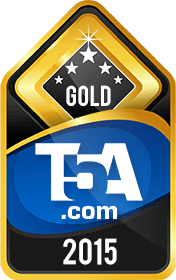 Gold Award Winner at Top Five Advisor! We are proud to announce that after a Realtime-Spy Review, Realtime-Spy was awarded the top remote monitoring software award at top five advisor. Read more about what Realtime-Spy has to offer you on our Realtime-Spy Features page. This page shows you screenshots, feature explanations, and much more to help with your purchasing decision.